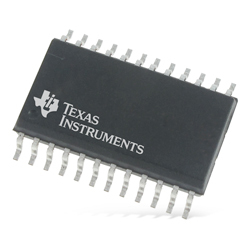 Texas Instruments LM5122ZA 3V-65V Current Mode Synchronous Boost Controllers are created for high-efficiency synchronous boost regulator applications. The standard control method is based on the peak-current-mode control. Current-mode control provides for inherent line feed forward, cycle-by-cycle current limiting, and ease of loop compensation. The device obtains high-efficiency using two robust N-channel MOSFET gate drivers with adaptive dead-time control. Further features include a programmable switching frequency of up to 1MHz and an internal charge pump producing a 100% duty cycle. An easy multi-phase interleaved configuration is facilitated through the 180-degree phase shifted clock output. The device provides thermal shutdown, frequency synchronisation, hiccup-mode current limit, and adjustable line undervoltage lockout. Typical applications include 12V, 24V and 48V Power Systems, Wireless Infrastructure, Audio Power Supply, and High-Current Boost Power Supply.